A friend mentioned how much her daughter loved the store bought glitter chalk the other day which immediately had me wondering about making my own version. 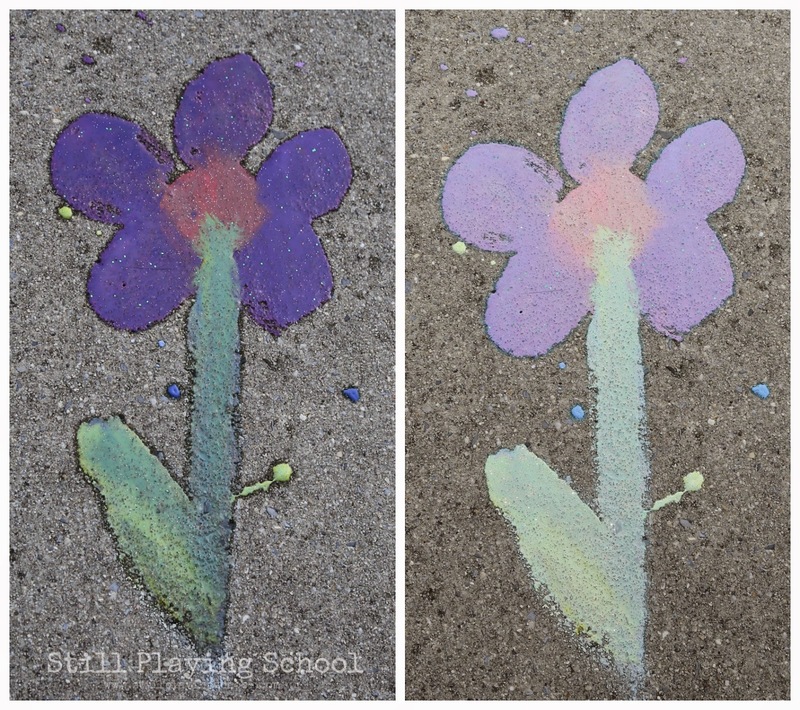 We've made sidewalk chalk paint in the past but everything is better with glitter right? 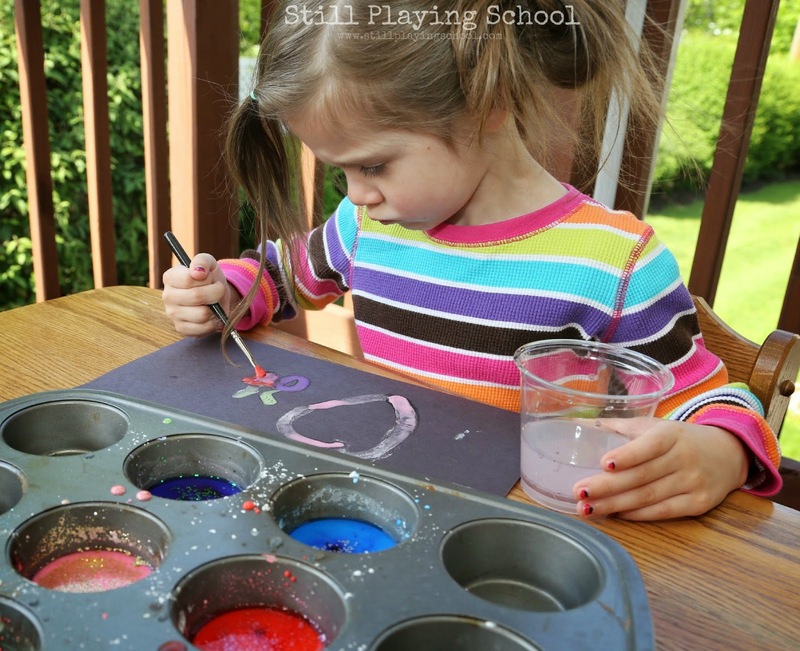 We created homemade glitter chalk paint! 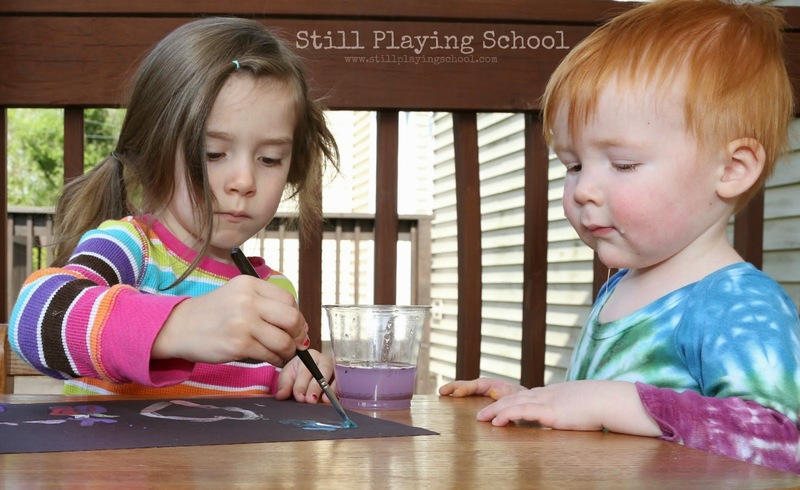 I made the chalk paint the same way we did last time with equal parts corn starch and water. This time I used a tablespoon of corn starch with glitter mixed in. We experimented using both Craft Project Ideas' glitter shakers and Martha Stewart's super fine glitter. Lastly I mixed in a tablespoon of water with colored with Wilton gel food coloring. I tried to use food coloring that contrasted with the glitter colors used so it would really stand out and sparkle! 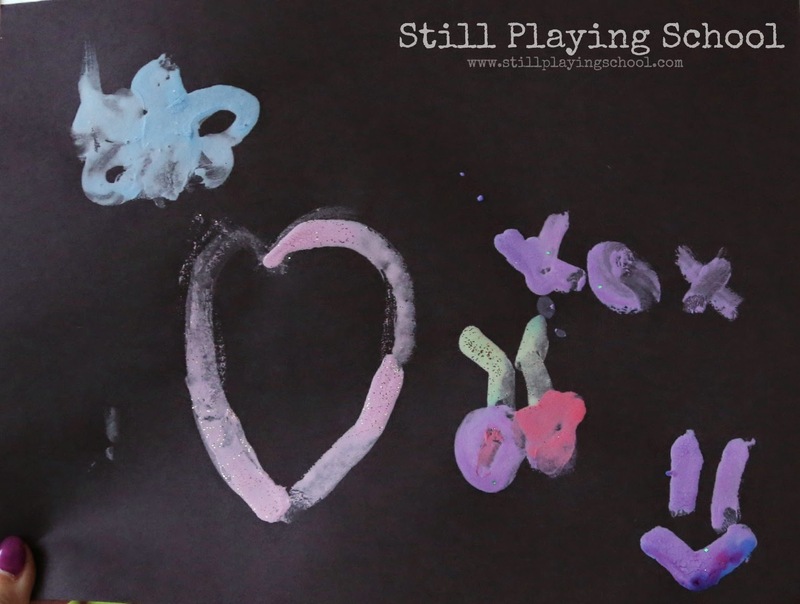 E has used all of her construction paper stash except the black so this was the perfect time to use the black paper to make the chalk paint pop! After trying painting with the glitter chalk paint on black construction paper for our title image above I let E try it too. D was also very interested and wanted to finger paint with the chalk paint! I had to remind E to mix the paints with her brush to loosen the corn starch from the bottom of the pan. This allowed her to get a lot more paint on her brush since these paints do settle a bit. When dry the paint looks very vivid and sparkly! It's exactly the effect I was hoping it would produce! 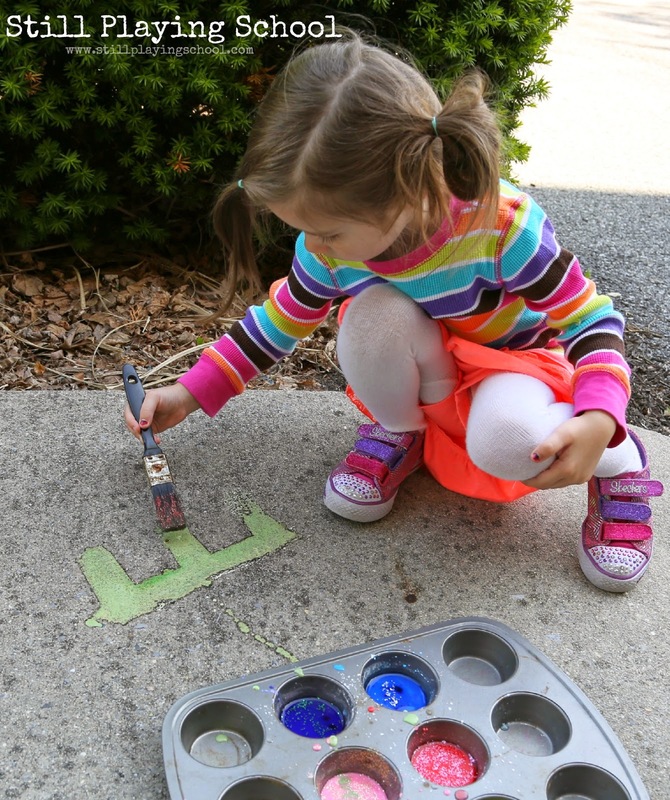 We had to try the paints outside on the sidewalk too! You might want to test a small area first to check for staining. In the past we may have had a slight residue after a short rain but it is storming today so I'm sure all of our artwork will be gone. It's doesn't photograph well but the glitter really shimmers in the sun! I just love how different these paints look when they are wet and then dry! 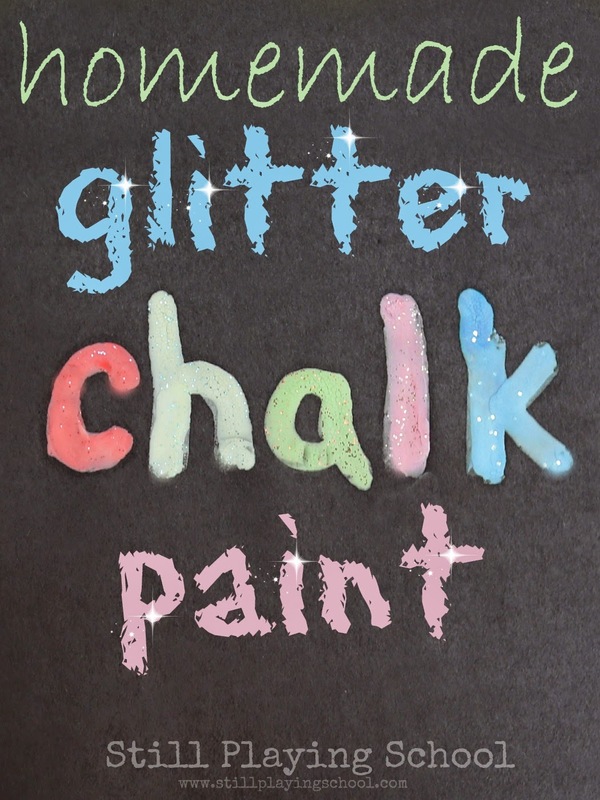 If you try our homemade glitter chalk paint we'd love to see what you create on our Facebook page! because we truly love creating with their products! 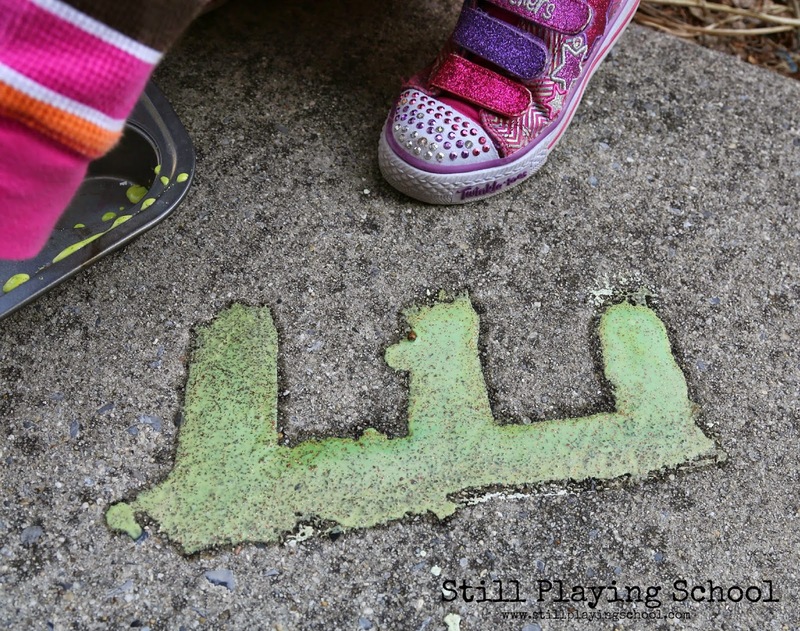 Follow Still Playing School's board Art with Kids on Pinterest.